When we built our second shadehouse, one of the design challenges was what to use for growing benches? 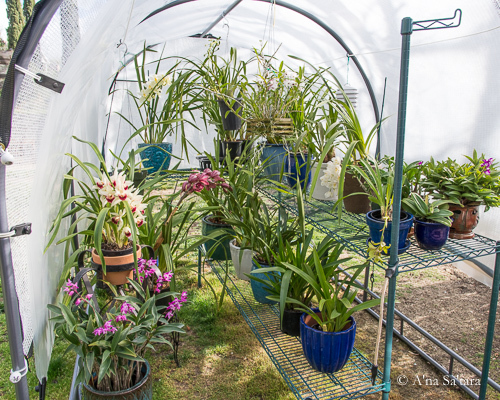 I’ve visited a number of greenhouses, large and small, and have seen a few great configurations. But what would work for our situation — a relatively small shadehouse (6′ x 8′) that would eventually be relocated (we rent our property) — was proving more elusive than I thought. Metal commercial benches are very expensive, and I didn’t want to invest so much in a temporary location. Wood, the standard choice for slatted benches, is rather heavy. My husband cast a wary eye towards building the benches and then unscrewing all of the wood pieces to transport. He also very well knows that I like to change things and constantly have ideas for improvement. 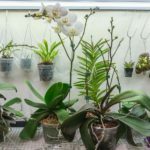 That’s the prelude to stumbling onto an unexpected solution that has become the indoor and outdoor mainstay of my orchid growing: epoxy-coated metal restaurant shelving. This is the industrial version of what you would see in a home pantry, or as pre-made shelving units at a big hardware store. These particular shelving systems are designed for use in “moist” environments — walk-in freezers and refrigerators, and dish-washing areas. They are built to regularly get wet, get cold, and be used commercially for years. Before I elaborate on my many uses, the caveat for anyone considering these for their situation is to consider their local humidity and temperatures. 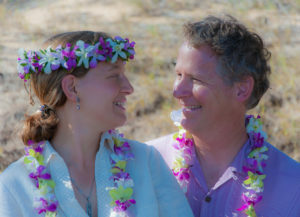 We live in central California, with a dry season in the summer, and cool, wet winter. My outdoor benches are all covered (in a cold frame shadehouse) or under polycarbonate roofing. They don’t get rained upon, and, in the summer, they dry off relatively quickly (a couple hours at most) after watering or misting. That being said, after a couple years, they are still in pristine condition. There are several versions of these wire shelves, with different coatings. I exclusively use the “green epoxy” version made by Regency Shelving since it is designed for wet conditions. (Other coating types are intended for dry storage or displays). Two tiers of benches in the shadehouse. The top tier is 21″ deep and the second tier is 14″ deep. What makes these work so well as benches? 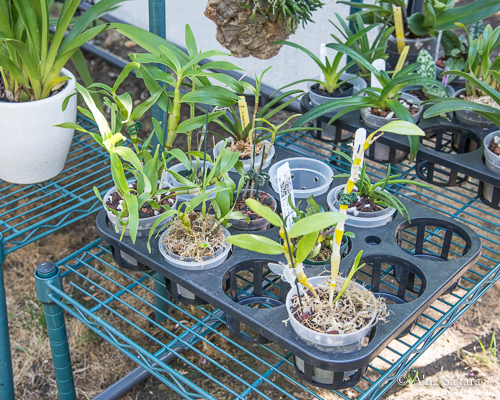 First, they are designed to support up to 300 lbs per shelf — zero sagging with two rows of large Cymbidium pots. Second, they come in a wide variety of sizes: from 24″ – 60″ long and 14″-24″ wide. I’ve found that the 18″ and 21″ widths are most versatile; they also accommodate standard plastic pot trays. Third, they can be assembled, disassembled, and stacked easily. You can set the height of the shelf anywhere from 6″ to 72″ above ground, depending upon the legs that you select (they come in sizes from 14″-84″ tall). Each leg is indivivdually marked with height lines so you get the shelf level without too much fuss. Also, for stability, I have created tiered benches — both stacked vertically and tiered horizontally. 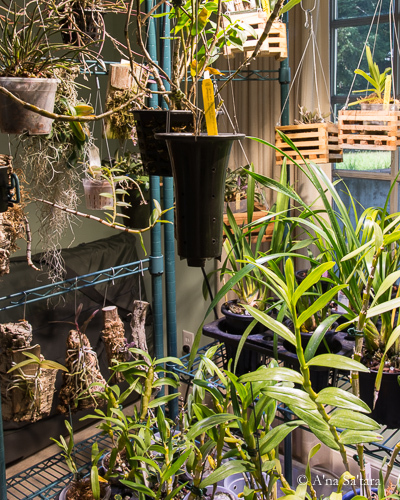 It is much easier to view and reach pots when there are two 18″ shelfs, a separated by 12-18″ in height, than to reach across one 36″ deep platform. I use these horizontal tiers both in the shadehouse and for my growing area with high intensity LED lights. There’s a rather unexpected application of the accessories for these shelving units … I can’t imagine what the restaurant originators would think seeing a line of mounted orchids on them! You don’t see the accessory options at stores, and I only discovered them when looking at the online catalog. The shelf systems offer a series of cross bars (14″-48″) and 6″ hooks that can be attached to the legs, either supported on each end by a pole, or, for lighter applications, just anchored on one pole. 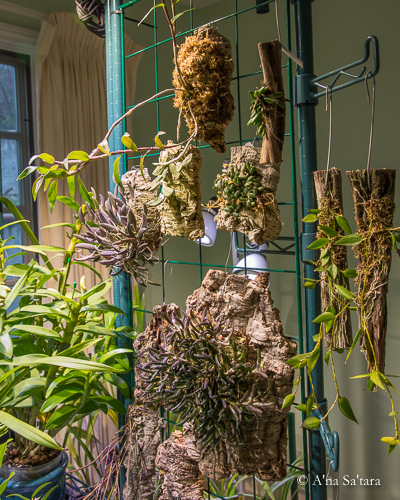 With these, I have used the tall leg poles (72″ or 84″) to make a series of hanger bars for orchids mounted on sticks or in baskets. Similarly, I’ve utilized the hooks for hanging small baskets or mounts; you can see these in several of the photographs of my growing areas. In several locations, indoors and outside, I have attached cucumber trellis panels to make a vertical area for hanging cork mounts. The 4″x4″ grid size of the cucumber trellis panels is a good size for mounts and they are coated with a green vinyl material that makes them weather resistant and waterproof. To avoid ceiling mounts, I attached the 48″ hanger bars to 84″ leg poles for my LED light fixtures, with the benches below. These units are exceptionally versatile for indoor setups, from lights to windows/sunrooms. Similarly, outdoors, I have used a wooden garden trellis, attached to hanger bars on 64″ poles with plastic zip ties, to create a frame for a polycarbonate roof over on two sets of benches. 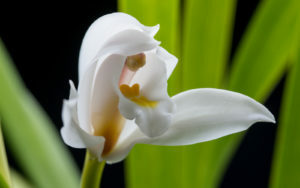 This simple roof keeps the leaves and debris from a nearby deciduous tree off the orchids. 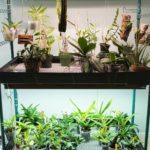 Finally, I created a 24″ cart on wheels for smaller plants, so I can offer the excellent eastern growing light that comes into the house through glass doors to Phals and Paphs. I simply roll the bench cart out of the way when I want to open and close the door. In the winter, the cart just stays put and I add a hanging bar for a basket or two to winter indoors. I hope the photographs of my growing areas, and the brief description above, sparks your imagination. I very pleased to have maximized the horizontal and vertical indoor growing space that I have, both under lights and in front of six glass doors. 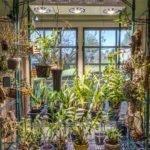 Likewise, I’ve been able to create three outdoor areas, with different light conditions, to accommodate a diversity of orchids.